The Utah Film Center will present the 12th annual Damn These Heels LGBT Film Festival July 10-12 at the Rose Wagner Performing Arts Center. The festival is a weekend-long celebration of independent, documentary and foreign feature-length films from around the world that explore LGBT issues, ideas and art. This year, Damn These Heels opens on July 10 with The New Girlfriend, a French psychosexual, trans, genre-bending film from acclaimed director François Ozon (In the House, Potiche, Under the Sand, Swimming Pool). The festival closes on July 12 with Boulevard by Dito Montiel (Sundance Award Winner, A Guide Recognizing Your Saints), which is a much anticipated film, featuring a standout performance by Robin Williams in one of his last roles. A diverse programming committee comprised of seven community members and five Utah Film Center staff has thus far received confirmation from eight films invited to the festival. In addition to the Opening and Closing Night dramas, two other dramas and four documentaries will be part of the 2015 Damn These Heels lineup. Upon confirmation from the other invited films, Utah Film Center will announce the entire festival lineup. “The programming committee considered over 100 films to put together a compelling program that features a broad selection of films that will resonate with every member of the community, whether people identify themselves as LGBT, allies or straight-but-not narrows. Our lineup includes films that illuminate a variety of social issues, while entertaining and engaging audiences,” says Patrick Hubley, Artistic Director Utah Film Center. Opening night film will have a limited amount of individual tickets available. Gurantee your seat by buying a pass, VIP package, or sponsorship! A subtle and moving drama following a devoted husband and dutiful bank employee who begins to confront his own secrets when he meets a troubled young man. Initial Festival Line-Up – More films to be announced! At the tender age of twelve, Roberto supported the Sandinista revolution in Nicaragua and fought for education and social reforms. He continued his political struggle fighting alongside the communist Tupamaros in Uruguay. Thirty years later he is struggling to live his life as a woman named Stephanía and striving to be accepted by both society and his family. In this hilarious, honest and romantic comedy, serial monogamist Elsie is beginning to feel restless in yet another long-term relationship. After breaking up with her girlfriend, she pursues the young DJ/barista only to face the disapproval of her friends and family and the growing realization that she may have broken up with her soul mate. Official Selection: 2015 InsideOut Toronto LGBT Film Festival, Frameline39: SanFrancisco International LGBTQ Film Festival. Presented in Lithuanian with English subtitles. Stunt planes fascinate seventeen-year-old Sangaile. She meets a girl of her age at the summer aeronautical show, nearby her parents’ lakeside villa. Sangaile allows Auste to discover her most intimate secret, and finds herself in teenage love with the only person to truly encourage her to fly. Throughout the 1950s Tab Hunter reigned as Hollywood’s ultimate male heartthrob, but the entire time he was living with a secret . In this explosive documentary feature, Tab’s dramatic, turbulent and ultimately inspiring life story is explored. 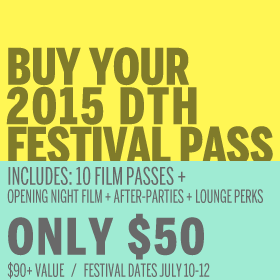 Damn These Heels festival-pass holders and sponsors gain priority access to the Opening Night film. A limited number of tickets to the Opening Night film will be available for $15 (including service charge) beginning June 17. Individual tickets for all other films can be purchased for $7 (including service charge) beginning June 17.